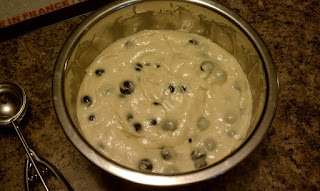 Blueberry Muffins and the Kitchenaid Mixer (take two) | Jenny. Maker. My fiance and I love muffins for breakfast! We just ran out of the Oatmeal Muffins from my previous post (I froze some of them and defrosted as needed) so, I thought I'd try the Oversized Blueberry Muffin recipe from my new Unofficial Harry Potter Cookbook (don't judge :P we're 10 years old at heart). I also thought this would be a good second trial of my new Kitchenaid hand mixer. So, I got everything ready and off I went! And then not... the mixer once again had trouble whisking just two cups of flour with just a touch of baking soda and salt! I know, I could have tried the beaters but they wouldn't give the same results and if I can do it by hand, it shouldn't have a problem. Once I did get the dry ingredients whisked, I started on the liquids. More trouble! 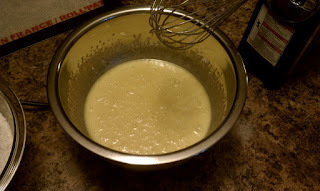 I just needed to whisk "two large eggs until smooth" and it didn't want to do it. Try as I might, it just wanted to push the eggs around! Eventually, I resorted to increasing the speed and jabbing at the eggs to break them apart (I bet that was a sight to see!). Then, I added sugar and increased the speed even more. The next few liquids went in easier and I finally had a consistancy I could work with. I then folded in the flour mixture, buttermilk and blueberries by hand. 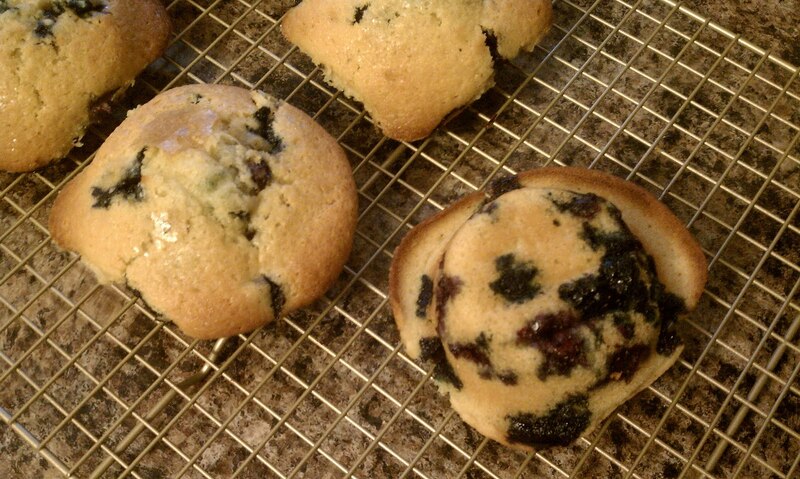 The last thing I wanted was for the mixer to create a lumpy or tough muffin. Next, I used my trusty cookie scoop to drop the batter into my muffin pan. Oops! I hadn't read part about "the batter should be level with the lip." So, I gave each muffin a second scoop, sprinkled them with sugar and threw them in the oven. When I rotated them half-way through, I knew these were going to be big. 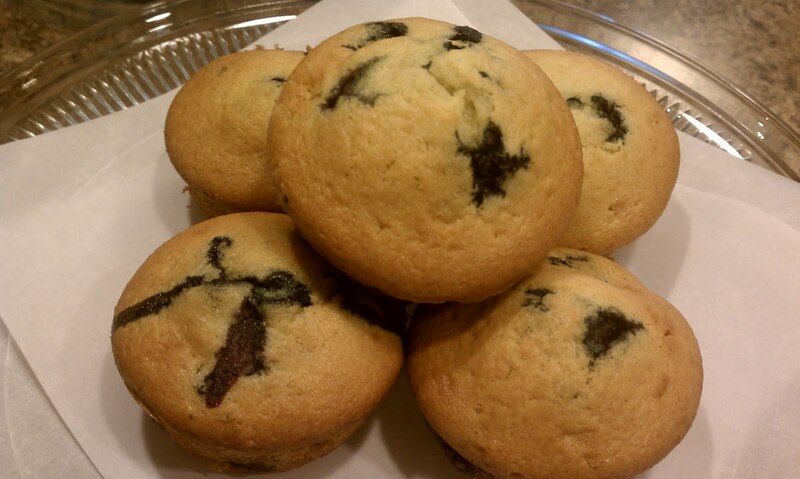 By the time they were done, the batter had overflowed the cups and each muffin was actually touching the next! My double scoop had actually been a heaping muffin cup and created a very funny muffin. Lesson learned - next time I'll use one large scoop and one smaller scoop. The second batch of 6 can out much better that way but in the laughter of the overflowed muffins, I forgot to respray the muffin tray! Oh what fun! I really must get that 12-cup Goldtouch muffin pan I've been eyeing at Williams-Sonoma. Funny appearances aside, the muffins taste delicious! I'd still call them a success! Any housewife knows mistakes are bound to happen, unless perhaps you're Martha's clone, and it's always best to dust off your apron and keep going!